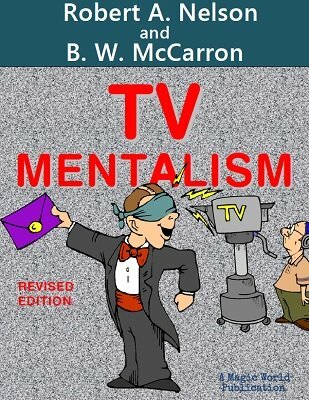 No longer must you be content to merely watch and be mystified by TV mentalists. Embarrassing, isn't it, to have our friends recall the miracles of a TV mentalist and ask YOU how they were accomplished - when you might be a successful TV mentalist yourself! You, too, can bask in the limelight and glory of television. All phases of successful operation are covered in detail in this volume, written by mentalists with many years of actual experience. Actual program methods and routines, including the sensational and baffling "Brain Busters" are explained. The "Brain Buster" methods and much of the material can also be used for stage or club presentations. Practically all of the material and "Brain Busters" can be performed with equal effectiveness for live audiences, whether it be for stage, club or small groups. Learn TV programming • guest appearances • sponsored shows • local and network broadcasts • advance preparation • camera technique • suggested programs and actual routines • where and how to commercialize your act using TV • opportunities in radio • live vs. remote broadcasts • performing rights organizations and more. Updated to include information on Internet video clips • the effects of HD quality on props • where to obtain hands-on instruction in your area • how to get started • your first TV appearance • cable TV opportunities • how to parlay your first performance to bigger and better shows • the master secret • and so much more! McCarron's lesson in how to land your first TV gig is easily worth a hundred bucks by itself. If you've ever considered moving your act to the next level, read this book and prepare yourself for the amazing opportunities that TV can offer you! Expanded reprint of the 1955 first edition publication, featuring entire new chapters, more case histories, more than 40 illustrations and hundreds of corrections and updates. 73 pages.